Prepare your children for swimming with CBRC’s Swim Lessons. 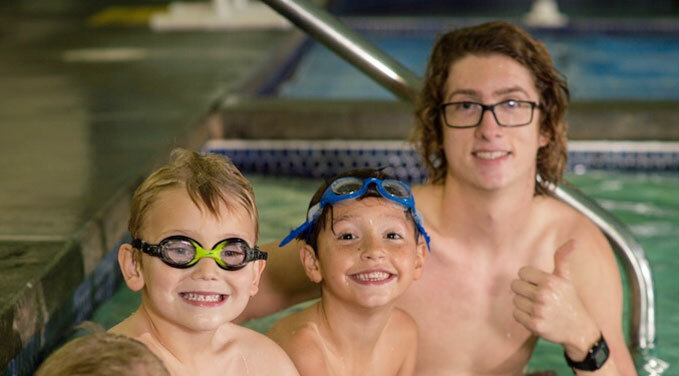 CBRC’s qualified swim instructors incorporate water safety into teaching your children how to swim and have fun! Classes are open to children of all ages and are offered year-round in the morning, afternoon, and evening. Find a class that fits your needs! PRO TIP: Print, fill out, and bring in our packet to make sign-ups fast and easy! Give us a call to state your availability and swimmer’s skill level. We will place you with an instructor as soon as possible! Help our instructors and fellow students stay healthy. Please refrain from bringing your child if they have any of the following symptoms: runny nose, consistent or chronic cough, ear infection, fever, rash, pink eye, or diarrhea. Our group lessons are a 4:1 student to teacher ratio. If a class has 1 student or less, it may be cancelled. Each class is 30 minutes in length and must have at least three swimmers registered. An additional instructor will be added to classes with more than four swimmers. Make-ups must occur during the current session and within a class of equal or lesser ability. We will offer two designated make-up days per session. If your child misses a class due to illness, you may reserve one spot during a make-up day, as long as there is a spot available. You must reserve a spot by the Thursday before the make-up day. Make-up classes are limited. We do not guarantee the availability of make-up classes. We will not grant refunds or credits for missed classes. No refunds will be granted after the first class. For more information, please contact Kari Woelber at (509) 943-8416 or Kariwoelber@my-cbrc.com.